willing to put their lives on the line…now, it’s our turn. We must face the realities of social class. Throughout history, the working class has misunderstood the master class. This reflects the differing morals of each group. While the working class follows The Golden Rule; the master class intentionally takes advantage of our inclination to do so. Nationalism is sold to us, by the master class, so that we will fight their wars for them. Our ignorance is increased, by the master class, so we are easier to manipulate. Racism and bigotry within the working class is propagated, so that we will fight each other and not focus on our real problem: the greed and destructiveness of the master class. Bernie offered to bring the working class together. And so, Trump leapt into action, in an effort to keep up divided. Why? 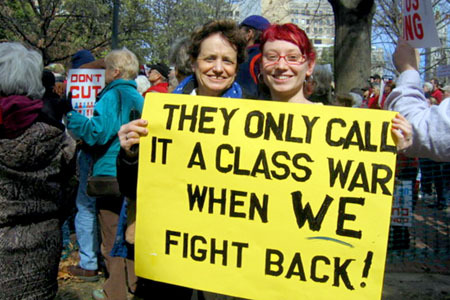 Because a united working class is the only thing the master class fears. Objectively, history and current events prove that the master class can not be trusted. Yet, we try to convince ourselves that we can. Why? Is it just because we don’t want to believe that they can be that bad? Well, they are! So, what are we going to do about it?